If you didn’t know, September is National Atrial Fibrillation Awareness Month. As up to 35% of patients in our community have heart valve disease AND atrial fibrillation, here are 6 important facts about atrial fibrillation. Atrial fibrillation (AF) is the most common sustained arrhythmia encountered in clinical practice. Its incidence increases with age and the presence of structural heart disease – like valvular disorders including mitral regurgitation. Stroke and heart failure may result patients with atrial fibrillation. To help you learn more about atrial fibrillation, I made this video with Dr. Vincent Gaudiani, a leading heart valve surgeon who has performed over 10,000 cardiac procedures in Northern California. 2. Is it common for patients with heart valve disease to have atrial fibrillation? In an exchange with Dr. Patrick McCarthy, the Chief of Cardiac Surgery at Northwestern Medicine, I learned that about 30% his patients have a known pre-operative history of atrial fibrillation. Interestingly, some patients are asymptomatic and not aware they have atrial fibrillation. Atrial fibrillation is more common as you age. It usually starts out with episodes that come and go, so it can be difficult to document. Over time, the Afib episodes become more frequent and may no longer convert to a normal rhythm on their own. Without treatment, Afib can become chronic. Having Afib increases the risk of stroke, so it is important to diagnose and treat it. 3. Does valve disease cause Afib? Or, does Afib cause valve disease? Or, can they both impact each other? Thanks to Jane Kruse, the heart valve and atrial fibrillation clinic coordinator at Northwestern Medicine, I learned that AFib doesn’t typically cause valve disease, but there is a relationship between them. Most Afib originates in the left atrium. 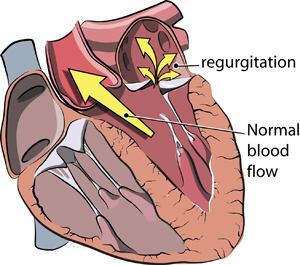 In patients with mitral valve regurgitation, the blood flows backwards into the left atrium and makes that heart chamber enlarge. Often, Afib will result from this. When this happens in asymptomatic patients with severe mitral regurgitation, it is a sign that it is time for surgery to fix the valve. Occasionally, Afib can cause mitral annular dilatation and lead to secondary mitral and/or tricuspid valve regurgitation. 4. What percent of patients needing heart valve surgery require concomitant Afib treatment? 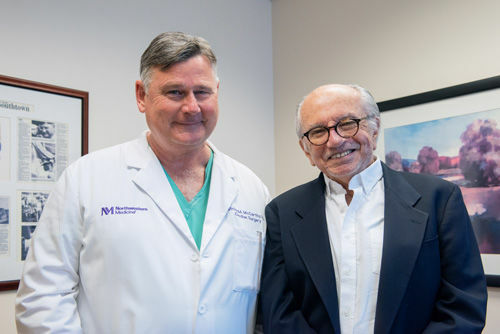 In discussing this question with Dr. McCarthy, I discovered that of all types of cardiac surgery patients presenting with a history of atrial fibrillation, Northwestern treats the atrial fibrillation in about 80% of the cases. It only adds a few minutes to the procedure and, in general, gives an 80% chance of eliminating the Afib. 5. Is there anything else that heart valve patients should know about Afib? Dr. McCarthy and Jane informed me that Afib can happen after cardiac surgery in about 30-40% of patients who never had Afib prior to surgery. This type of Afib is usually short-lived and resolves within a few months after surgery. When patients have Afib after surgery, they are started on new medications — for a few months — to thin the blood and help control the heart rhythm until they go back to a normal heart rhythm. Here’s a video I recently filmed with Dr. Gillinov about AFib after heart valve surgery. 6. Do you have any success stories of patients who have AFib and heart valve disease? Over the years, I’ve been very lucky to meet and to support many patients with AFib and heart valve disease. Several of those stories are posted in our new AFib Videos section of this website. Off the top of my head though, here are two stories you might like to watch. The first success story is of Linda Staples, a grandmother from Indiana who was very, very, very sick prior to getting help from Dr. Marc Gerdisch. The second patient success story is of Mark Buciak, a 38-time Boston marathon runner, who was shocked to learn that he suffered from Afib and valvular disease. I hope this helped you learn more about Afib. Thanks to Dr. Gaudiani, Dr. McCarthy, Dr. Gillinov, Dr. Gerdisch and Jane Kruse for sharing their research and clinical experiences treating patients with Afib and heart valve disease. Adam, was there any discussion of relationships between AFib and aortic valves, AO valve regurgitation, etc.? Adam, great article thank you! I had a MVP and when my LV enlarged I ended up with AFib. My surgeon was adamant that I did not need concomitant Afib surgery explaining that when my heart remodelled after my MV Repair it would resolve. I went with his expertise and I am glad to say after the surgery and then waiting for ~ 12 weeks for my heart to recover enough from surgery, I had a DC cardioversion two years ago on 1st Oct 2012 and have been in NSR since that day :)) Indeed I am fitter now than most of my peers and at 58 comfortably run 5-6 days and 15-20 miles a week accomplishing 5K and 10K regularly. I am off all meds with the exception of mini aspirin. My BP averages 102/75 and resting heart rate ~55. Hi Vi, Thanks for the kind words about this post! As for the medications you are taking, I would encourage you to discuss this with your doctor. Dr. Gaudiani mentioned that anti-coagulation is used for a-fib patients because of the turbulence in blood flow. Why isn’t that important for patients with similar turbulence due to mitral or aortic valve regurgitation? Good news! I passed your question over to Dr. Vince Gaudiani, who is featured in the AFib video above. Luckily, he quickly responded. Many thanks to Michele for her questions and Dr. Gaudiani for his answer! Thank you for following up, Adam! Can you have surgery to correct the Aorta fib. and when do you need the correction. First, thanks for another great article (they’re ALL great!). Second, my question. I had OHS three years ago for both a mitral valve repair and an aortic valve replacement (bovine). After surgery I went into AFib, which my surgeon said happens to about 35% of patients. We cleared it up and now I’m fine (I think!). My question is, how can I tell as time goes on–I’m 73 now–if I’m starting to get it again, so I can get treatment. I wouldn’t want to realize it until symptoms are severe.